Inflammatory bowel disease - from now on shortened to IBD, is discussed in this article as a term for both Crohn's disease and Ulcerative Colitis. As you no doubt know, if you have one of these conditions, or care for someone who does, the two are quite distinct clinical entities with different symptoms, different locations in the body and different diagnostic criteria, but in terms of a herbalist's approach, as it is in conventional medicine, we can use the same kinds of treatments for both. Speaking of conventional medicine, I am heartened and hopeful with the new class of biologics I see coming through in recent times. I am under no illusions as to how serious IBD can be and have met far too many patients who are reliant on doses of steroids or other forms of immunosuppressive drugs that are far too high to not want there to be much better conventional methods to manage these conditions in their advanced stages. 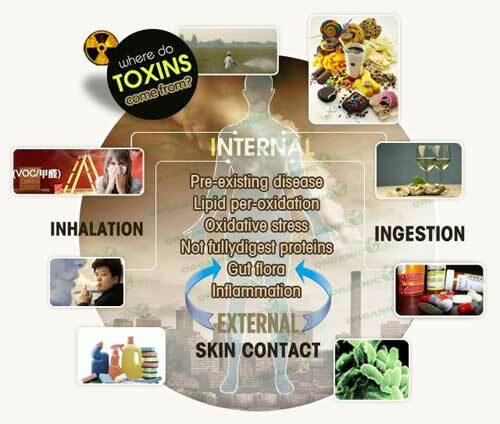 What we can best do in holistic medicine is to work on the 'terrain' underlying the condition and, in the best cases, effect a lasting change in those causative factors that gave rise to the IBD in the first place. We should set our aim high, we have every reason to, but we also need to realistically acknowledge that this kind of work is slow, and its effects are accumulative rather than dramatic. In terms of working together, even if the main reason they have come to see me is that they want to get off their prescription drugs, I advise my patients to wait until they have made real, tangible and lasting improvements before they reduce or withdraw their pharmaceutical medications. If it is possible, I also encourage my patients with IBD to remain in close contact with their Doctor or specialist and recommend that they be open with them about using herbal medicines or dietary changes etc. alongside their drugs. We have very clear laws under the Health and Disability Act in New Zealand that mean they cannot be discriminated against for choosing to use herbs and other natural ways of healing. They should expect their doctor to be supportive and to have the same goals for their patients, that they are well enough to not need medication, let alone surgery, that they get better. I've been in full time practice in Christchurch, New Zealand since 1989. A significant number of people with IBD have come in over those years, partly for reasons that the first case history will shortly show. Many have had good results and, whilst each case is different and clearly needs an individualised approach, there is also common ground between people and some general recommendations are discussed further below. Firstly however, from the clinic files, a basic summary of three cases are presented. Much more could be said about each one, indeed there are many pages of notes in their files about how we have adapted their treatment programs and worked through different aspects of their case. The intention in showing a summary here is to inspire some reasonable hope as well as to demonstrate how quite different kinds of approaches can be needed to get a good result. Connor was a University student at the time, a bright, warm-hearted young man with a great future who had just been told that he was going to have to lose a large part of his bowel to a major surgery because it was so badly inflamed and ulcerated. The above liquid extracts were combined into a formula to make 210mls, which will easily fit into a 200ml amber pharm round. The dose was 5 mls three times a day, reducing to twice a day if and when he felt obviously better. 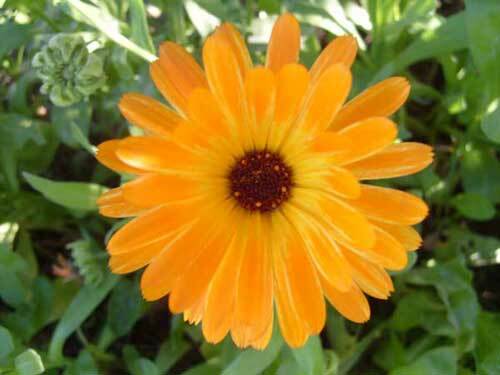 Calendula & Yarrow are famous 'wound-healing' herbs. 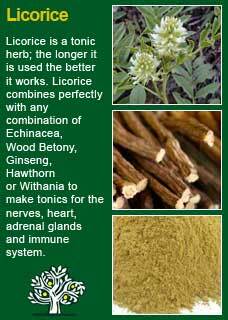 Chamomile & Cramp bark release spasm and tension from the gut and Licorice has a number of natural anti-inflammatory compounds in it. The dose for the Slippery elm powder was 1 heaped tsp, slurried into lukewarm water and drunk down in one go. The frequency of the dose was to take a dose each time he took the liquid formula, i.e. two or three times a day. Slippery elm can form a remarkable kind of 'bandage' in the gut. It doesn't work for everyone, nothing does, but it has been extraordinarily helpful for quite a few people with IBD and should certainly be considered as an option in many cases. For such a simple treatment, Connor's response was extraordinarily good. His symptoms rapidly improved and his condition eventually went into remission. He never needed the surgery and I lost track of him some years later but have to trust that he would have got back in touch with me if things went bad again. As it happens, Connor was closely involved in the Inflammatory Bowel Disease (IBD) support group in Christchurch and, on the strength of his own experience, invited me to present a talk to this group some months after we first met. It was my first ever public talk, I was understandably nervous but prepared for it as best as I could and at least was only expecting what I thought a support group would look like, namely a small handful of people sitting in a circle of chairs in some dusty room. You may imagine my surprise when I walked into a large auditorium of nearly a hundred people, including several nurses and doctors who specialised in this area. It was probably lucky I had no idea what I was walking into beforehand as I might have bailed out but, as it happened, the talk went very well, the professionals asked open and friendly questions and everyone there was very receptive. I recount this because, as a direct result of this talk, I had many patients with serious IBD come to see me over the following years and, whilst we did get some encouraging results, in the beginning none were even as remotely good as Connor's. I was learning first-hand the vital lesson that each case is different and, if you really want a good result, you can only get part way there with medicine, the patient must also do some 'work' on their 'terrain'. I first met Bethany, or Beth, when she was 27 years old. She had serious and relapsing IBD, was on a cocktail of drugs but still experienced frequent pain, bloating and bowel frequency to the extent of being unable to keep working. My mind usually goes to my hardest cases when I think about presenting a case-history, Beth was one of those. Her relationship had broken up, which she blamed on her health, she was unable to pursue her career-path and she had moved back in with her parents, something she was less than happy about to put it mildly. Beth was from the 'Eagle' constitution (more about that later). Asking her open questions about what she herself thought were the roots of her getting sick she was sure that it was excess stress in her early 20s that had caused such a damaging imbalance in her immune system. The above liquid extracts were combined into a formula to make 560mls. This will just fit into a 500ml amber pharm round bottle and is enough to last about 4 weeks if taken at the maximum safe and effective dose of 10mls twice a day, which is what we used. 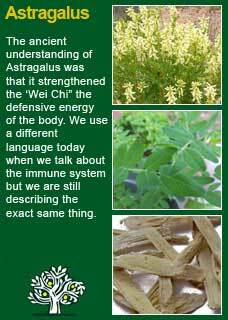 Astragalus, Withania and Licorice root are all reliable immune tonics without any risk of their being overly stimulating or unbalancing. Skullcap, Chamomile and Wild Yam are calming and relaxing to the gut and the mind. We also used the high dose of four capsules, twice daily of concentrates of Hawthorn berry and Reishi mushroom. 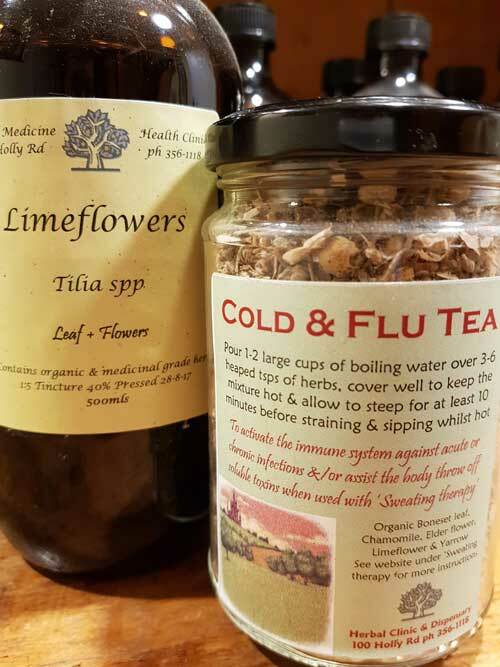 Hawthorn is a general tonic and Reishi mushroom is surely one of the most important herbs in all of Nature for auto-immune conditions; calming, nourishing and helping to bring balance. The first step in the healing journey comes from Nature. We come to a point where we are unable to fix ourselves and then these ancient allies, the herbs, can help us to get well. The next step is the 'work'. It is what the patient does to help themselves. Few people will get a great result from using medicine alone as was Connor's case. Underlying all the old ways of healing is an understanding that living organisms have the ability to self-repair, unless something is getting in the way. The 'work' is usually doing something to remove the obstacles that are getting in the way of that innate, self-healing intelligence. Beth had built up a great knot of nervous tension in her body. She had somewhat adapted to it, so it felt normal to her to be tense all the time, but she was really incredibly wired up! Her work was to loosen the knot and unwind the wire. Easier said than done for sure, but where there is a will there is a way. In fact, people often know very well what best works to relax them, they simply stop doing it when they became tense. Beth needed to do things physically to relax, she had been far too much in her head, even more so when she felt her body was betraying her. Going back to gentle forms of sustainable exercise, picking back up some long-forgotten craft work and cooking hobbies was what worked best for her. The biggest part was that she would give herself permission to rest, relax and get better. I have found that a large percentage of people who suffer from all kinds of autoimmune conditions will say that they feel it is stress that made them sick in the first place and that it is stress that causes them to have their relapses. 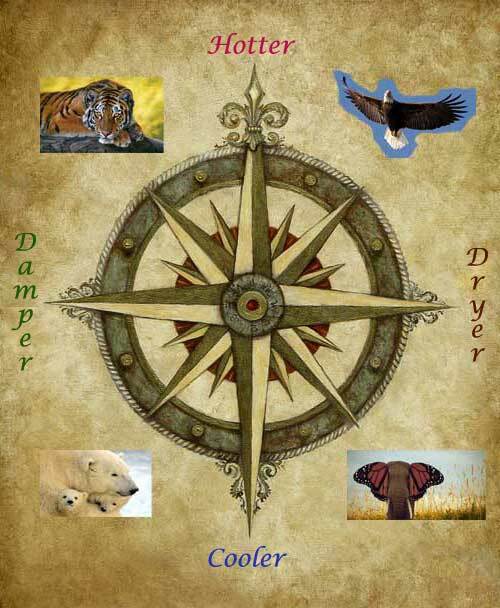 When they can use this knowledge to empower themselves to destress, to undo the many layers of built up tension, there can be a radical change in the condition, gradually, over time. Beth was a memorably hard case because it took a long time to get to a good place. I met with her many times over the coming two years. We changed the treatment plan around, as you do when things are not going well enough, fast enough, but looking back I can say that the biggest factor in her eventual recovery was her just slowly getting better at relaxing. It was not a quick process but, by the time we stopped needing to book follow up appointments she was completely drug free and had not had any significant relapses for over 3 months. This was several years ago now, I also remembered Beth's case because I have seen a close relative of hers recently and, asking after her, I was told that she is in a new relationship, new job, new flat, new life. Maybe her condition will come back, none of us can escape stress whatever we do, but she knows how to use herbs that help her to relax and will surely do whatever she can to keep from getting too stressed in the long journey ahead. I first met Nick when he was in his mid-40s. He was a 'Tiger' constitution and had a long history of IBD - ulcerative colitis. Nick had managed to avoid surgery but had used enormous amounts of steroids and immunosuppressant drugs and was in a very poor way in his general health. Broken capillaries over his face, thin skin everywhere, aching joints, constant fatigue and frequent flare-ups with much bloating, frequency, bloody diarrhoea etc. Nick was sure that stress was a major contributor to his condition and the various family stresses that were happening in his life were often the trigger to his flare ups. He had been tested for coeliac antibodies and given the all clear on gluten, but he had his doubts about it as he frequently felt bloated and worse when he ate a lot of bread or pasta. He also noted that he felt very sick if he drank any amount of alcohol and, as we usually use the primary herbs in tincture form I asked if he would commit to using the medicine in tea form for a time, to which he agreed. This recipe made 300gms of dried herbs - a large bag. Nick had some accurate kitchen scales and he was to measure out 12 grams into about 700-800mls of freshly boiled water. Cover and allow to steep for about 12-15 minutes, then strain and this was the day's medicine, the whole amount to be taken during the day, preferably in at least two or three divided doses so that the tissue healing ingredients in the infusion would regularly come into contact with his gut lining. Four capsules, twice a day. I generally prefer to use the powder but not everyone can stomach it and I thought it would have been a bit much with having the tea and the Barbiotic (below) to take as well. Two capsules, twice a day. Turmeric & Willow have potent natural anti-inflammatory effects within the body and, like powdered Slippery Elm bark, have often been seen to help people with IBD. Four capsules, once a day at night To help rid his gut of undesirable micro-organisms. One rounded tsps, once a day in the morning. Containing powdered Barberry, also to help dysbiosis in his gut, and 14 different kinds of probiotics to help build up a healthy microflora. The Wormwood capsules and Barbiotic powder are a common treatment plan for a limited time period, usually just a month or two, for people with IBD. Killing off the bad guys in the gut and helping to populate a healthier 'microbiome' can be a beneficial strategy in many cases. Plus, we had to work on his stress, which was a twofold process. One was talking through some strategies to better deal with some relationship issues with some key family members. The second was doing things that he knew would relax him which in this case was making time for himself to do something he used to love but had given up some years before, namely playing golf! Like the others, Nick has many other pages of notes in his file that I have not touched on. We used the tea on and off several times and he grew to rely on it to help him when he would start getting a flare up. 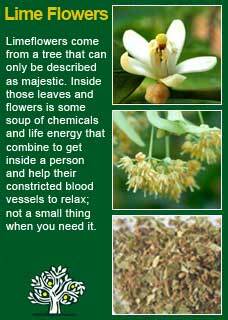 The Turmeric and Willow had to be used at double the starting dose, i.e. 4 twice a day, when he was bad but just taking a couple a day was enough to help keep him well at other times. We eventually started using herbs in liquid extract form that he tolerated without any trouble. Slippery elm capsules ended up being one of his favourite things to help him when he was getting bad. He would take 4 or 5 of them every few hours and would say that he could feel them bandaging his gut and stopping the ulcers from opening up and going crazy. Again, he got completely drug-free and has stayed that way for many years now. It took a lot of time and a lot of work but he is healthier in all regards. It was a hard journey but it was worth every step. I've mentioned that Connor and Beth were Eagle constitutions and that Nick was a Tiger. On personal reflection, it seems that the majority of the people with IBD that I have worked with have been from the hotter side of the spectrum but there are certainly plenty of exceptions to that too. 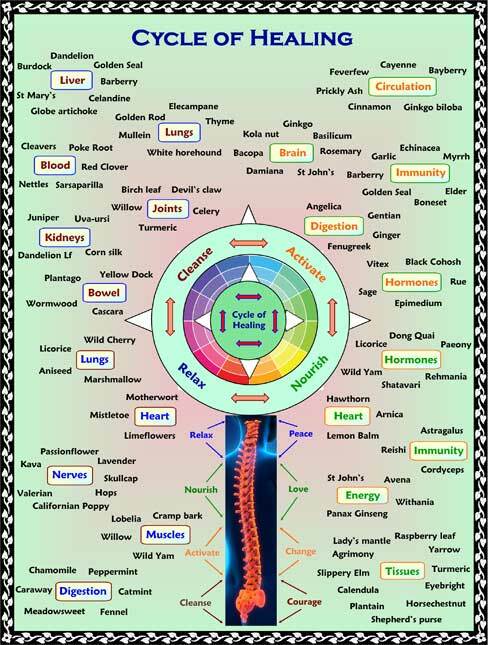 In any case, this ancient way of understanding our differences, according to how we are naturally either hotter or cooler, and at the same time dryer or damper, underpins much of the approach to what kinds of foods, herbs etc, will best help a person. Much of the research into autoimmune conditions has looked for the causative organism that sets off the disordered immune response. It would certainly make sense that some kind of chronic, as yet undetectable, stealth virus was the root of the issue, and maybe, at least in some cases, it really is, maybe. Even so, it is 'the terrain', the underlying condition of the person, that is the key determinant of whether they get better or they get worse. Whether their immune system fights its battles and retreats from the field or, for whatever reason, stays 'up in arms', even to the point of turning on the tissues of its own body. Many practitioners that work closely with people, in all branches of medicine, come to a similar understanding about this, because it is what they consistently see in their day to day practice. That the people with the healthy 'terrain'; good lifestyle, good diet etc, soon shrug of their illnesses whereas people with unhealthy terrain; rough histories, bad diet, poor self-care, injurious levels of stress etc. can get sick but might not get better and, in some cases get worse, even to the point of developing a disease. However, by the time we get to the point of giving the disease a name, much or any thinking about the history of what was happening in the last year or two prior to getting sick tends to get swept aside. Symptoms are overwhelming things to experience. Most of us react to them with fear and, if someone says they are happening because of x or y disease and that these drugs (usually some kind of steroids or immunosuppressants in autoimmune conditions) will make them go away then we have little hesitation to get started and hope that the storm will quickly pass. The storms do pass with steroids, etc. for at least some people but equally, clearly, it seems that they only help much in the beginning and then they give diminishing returns from then on out, often with the price of some very worrying side-effects. To treat autoimmunity from a holistic perspective, you must understand that with most health conditions, the self-healing intelligence in all its parts, including the immune system, is making a concerted effort to correct whatever has gone wrong. Illness is an invader, whether from external factors of from whatever else is going on internally, and the organism recognises this and does all that it can to restore health and balance. However, autoimmunity is different, if the body was a country and the 'army' of the immune system usually robustly defended itself against microbes, toxins, mutated cells etc. then an autoimmune condition is like a civil war where some part of the army has turned against some part of 'self'. In most health conditions, if you can work out what is obstructing a person's life force, their vitality, then you can see a speedy return to health. When the person feels better they get better. It is sometimes like that with autoimmunity but sometimes it is much trickier to get the shift because it may not at all be a lack of vitality behind the errant immunity. I heard the analogy some time ago and I think it is a useful one that, instead of thinking of an autoimmune condition coming from an immune system that has become hyperactive, it can be better to understand it as being like a tired and grumpy person who has gone past being reasonable and is now just snapping, or lashing out, in all the wrong directions. It becomes reactive against self because it was already feeling stressed and intolerant to begin with. People intuitively understand this analogy when it's about themselves or someone they care for, it makes sense to them and they can relate to it in the story of their own life. Unless they are very superstitious, it makes much better sense that they have not been struck by the lightening of a potentially life-long condition for no other reason than bad luck. Their 'terrain' with all it entails, has set the stage and the civil war has come, but not for no reason. If all this makes sense to you who are reading this, then the next question is 'what can we do to help? 'In this matter, sometimes the most important area, and one that at least must always be carefully considered, is the diet. I am sure that food intolerance was a contributing factor in Nick's case. He could eventually eat eggs again without any problems but if he even ate a small amount of gluten he would be sure to start getting symtoms of inflammation in his gut within less than a day. Some esteemed colleagues of mine overseas who have done a lot of work with people with IBD ask all of them to completely exclude gluten as a matter of course when they start treatment. Perhaps they are right to do this. I'm not so sure it is a factor for everyone but certainly at least some people who get IBD have, as one of the deepest roots of the reason why they have it and can't get better, an undiagnosed food allergy or intolerance. Certainly, if there is any history of eczema or asthma at any time in their health history then this almost should be assumed to be a part of the problem. This wasn't higjlighted in any of the cases above but it is a sure thing that, for at least some people with IBD, there will be a need to undergo a process of internal cleansing in order to shift 'the terrain'. Sometimes, people just instinctively know that their system is overdue for this kind of work. Perhaps they have been drinking or eating too much, or their system has had too many drugs for too long already. Sweating therapy is, at the least, intense, at worst, it is downright uncomfortable and something of an ordeal! However, it is safe and it definitely has the potential to make a big difference in any kind of auto-immune condition, including IBD, and should at least be considered as an option. The understanding is that, in seeing self as the enemy, the immune system has become badly misdirected. But it wasn't born that way. One of, or some combination of, stress, infection, allergy to something in the diet or the environment has set it off course. The principle behind sweating therapy is that you create a kind of therapeutic 'fever' in a controlled way for a brief amount of time. 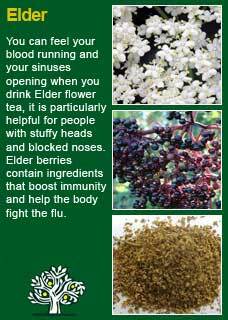 Then, especially when you have been initially been supporting the immune system for at least a few days with herbs, rest etc. this may work to 'bump the needle out of the groove', to reset the immune surveillance system to respond in the way it has been designed to against an external threat, rather than seeing 'self' as the enemy. 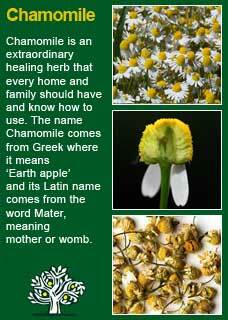 Some examples of helpful herbs have been demonstrated above. I would not be without many of them in even attempting to treat IBD. Slippery elm powder has been a life-changer for many, Chamomile, Yarrow, Calendula, Cramp bark, Reishi, Astragalus, Licorice root. all have clearly been of extraordinary help in many cases. There are others too, I fear to say too much more about all these herbs and other treatment options and so end up overwhelming the reader whom I wish to inform and inspire! The following is at least one example of how some common and easily obtained herbs can be inexpensively and effectively used as a gut healing tea. 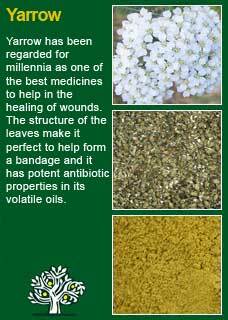 My primary use of Yarrow has been for people with internal wounds in their digestive tracts; anything from the tiny tears that cause the 'leaky gut syndrome' all the way up to full blown ulcers. 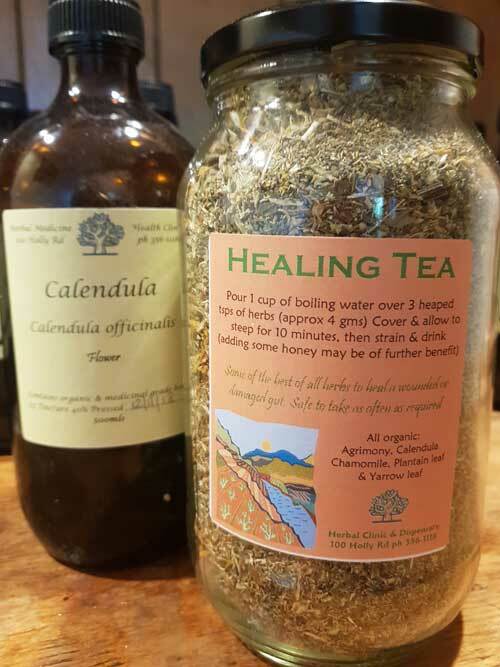 This above recipe will make 150gms - approx 2 jars of tea, and can be taken in the dose of 3 heaped tsps (about 4 grams) infused into a large glass of freshly boiled water, then covered and steeped for about 10 minute before straining and drinking. 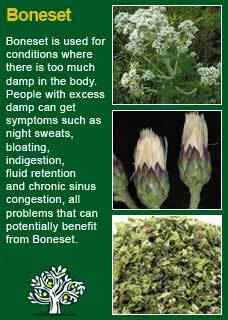 A stronger dose of herbs or a more frequent use of the tea can be safely given for more acute need. There are several further chapters in this site that focus on some key areas that are frequently implicated in the cause of chronic health conditions, including IBD. 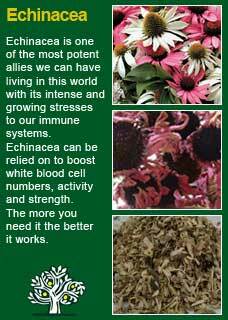 Each one discusses some safe and effective herbs that can help in each area. My intention here was to be honest about my experience with treating IBD and, without being able to give specific direction, to at least show that there are many treatment paths are possible. Healing is an individual journey and each person needs to find their own way along it. Ideally they will not have to walk too alone and, as I said at the beginning, if possible, find a good herbalist to help guide you on your way. If that is not possible then I hope you will still use some of the information here to help yourself or the person you care for with IBD. I am well aware of the usual medical lines that are said to people but I do not believe it is an incurable condition, nor that it must inevitably worsen with time. It is complex, tricky, multi-factorial, it is sometimes disheartening, especially when there has been an improvement and there is a relapse, but it is not impossible to help. Be of good heart and, whatever you do, do not give up on yourself or the person you care for. Keep trying to see the terrain and to treat the cause however much you can. Where there is a will there is a way.